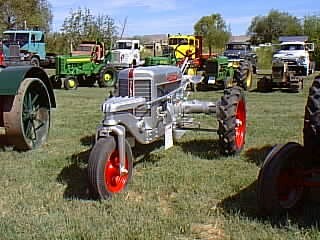 These tractors used a Continental engine and were capable of road speeds up to 30 MPH - most likely the fastest tractor of the era. All Rights Reserved. Reproduction of any part of this website, including design and content, without written permission is strictly prohibited. Trade Marks and Trade Names contained and used in this Website are those of others, and are used in this Website in a descriptive sense to refer to the products of others. TRADEMARK DISCLAIMER: Tradenames and Trademarks referred to within these website pages are the property of their respective trademark holders. None of these trademark holders are affiliated with TractorShed.com, our products, or our website nor are we sponsored by them. John Deere and its logos are the registered trademarks of the John Deere Corporation. Agco, Agco Allis, White, Massey Ferguson and their logos are the registered trademarks of AGCO Corporation. Case, Case-IH, Farmall, International Harvester, New Holland and their logos are registered trademarks of CNH Global N.V.